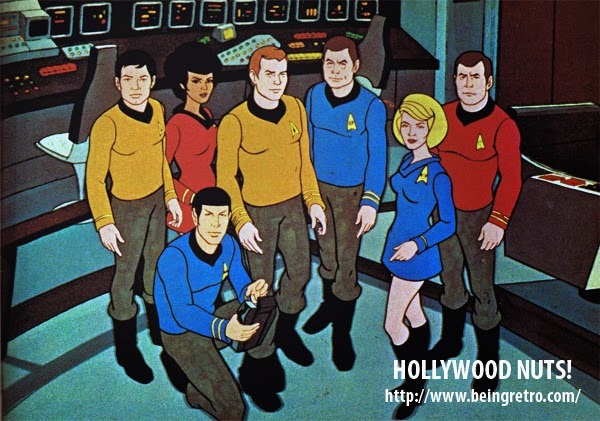 The series featured most of the original cast performing the voices for their characters, except for Pavel Chekov (Walter Koenig), who was omitted because the show's budget could not afford the complete cast. He was replaced by two animated characters who made semi-regular appearances: Lieutenant Arex, whose Edosian species had three arms and three legs; and Lt. M'Ress, a female Caitian. James Doohan and Majel Barrett, besides performing their characters Montgomery Scott and Christine Chapel, performed the voices of Arex and M'Ress, respectively. Initially, Filmation was only going to use the voices of William Shatner, Leonard Nimoy, DeForest Kelley, James Doohan and Majel Barrett. Doohan and Barrett would also perform the voices of Sulu and Uhura. Leonard Nimoy refused to sign up to lend his voice to the series unless Nichelle Nichols and George Takei were added to the cast — claiming that Sulu and Uhura were of importance as they were proof of the ethnic diversity of the 23rd century and should not be recast. Nimoy also took this stand as a matter of principle, as he knew of the financial troubles many of his Star Trek co-stars were facing after cancellation of the series. Should not have left Checkov out. They should have budgeted better. Good for Nimoy! Yeah, they shouldn't have left out Koenig. And yes, I watched this short-lived animated series when it came out. Anything for a Trex fix. Nimoy was a wonderfully supportive guy and that's why we loved him. One more reason to mourn his loss. I never heard that behind the scenes story before.